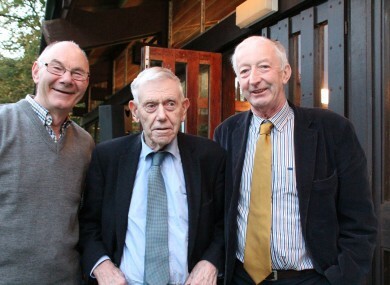 Mick Burke, centre, has been attending the Lisdoonvarna matchmaking festival for 70 years - and started out with "no notion of getting married". MICK BURKE ATTENDED his first Lisdoonvarna matchmaking festival with his mother in 1946, when he was a sprightly 23-year-old. Seventy years on, the 92-years-old sheep farmer from Borrisoleigh, Co Tipperary is still hopeful he will meet the love of his life. “I never married. I had a lot of lucky escapes. I fell in love with several women I met in Lisdoonvarna. I used to go home with a pocketful of phone numbers – this was my fodder for the winter! I would go out on dates and to dances but had no notion of getting married. “There would be lots of women from America back then, looking for a rich farmer. I had 200 acre sheep farm. Once I was dating a woman from Dublin and she came to visit me on the farm; it was particularly bad winter and we got snowed in for a few days. After the snow thawed she got straight on a train back to Dublin and that was the end of that. I think the remote location put a lot of women off. “I always said that if I had met someone that would have been the end to my trips to Lisdoonvarna. I would say the best thing about coming to Lisdoonvarna is to come with no expectations and you will never be disappointed. Email “'I've had a lot of lucky escapes': This man has been going to matchmaking festivals for 70 years”. Feedback on “'I've had a lot of lucky escapes': This man has been going to matchmaking festivals for 70 years”.